The Sydney Swans are the most supported team in the AFL boasting 1.174 million fans according to the annual Roy Morgan AFL supporter ladder. However, the 2018 results found that the Sydney team had lost 30,000 fans (2.5 per cent) from this time last year. The Swans’ numbers were almost double that of second placed Collingwood (660,000) and third-placed Essendon (651,000). But it was the fourth placed Adelaide Crows that was one the biggest improvers, adding 14.6 per cent more fans or 620,000 over the past 12 months. While 2016 premiers the Western Bulldogs increased its base by a phenomenal 42.1 per cent year on year to boast 351,000 fans. Reigning AFL Premiers Richmond also saw a significant jump in support up by 45,000 (up 10.2 per cent) to an enlarged supporter base of 487,000 while neighbouring club Hawthorn, three-time Premiers between 2013-2015, saw support increase by 17,000 (up 3.2 per cent) to 545,000 to become the third most supported Victorian club. After briefly surrendering their most supported Victorian club mantle last year Collingwood is again the most widely supported Victorian club with 660,000 supporters now just ahead of Essendon with 651,000 supporters. Despite holding the two top supporter slots, both these ‘Big 4’ power clubs saw a slight decline in support over the last year. Other clubs to increase their support included defeated 2017 Grand Finalists Adelaide now with 620,000 supporters up by 79,000 (up 14.6 per cent), newcomers the GWS Giants up by 2,000 (up 1.1 per cent) to 177,000 and Carlton up by 26,000 (up 5.6 per cent) to 490,000 despite a disappointing 2018 season. Although it is no surprise to see the traditionally well-supported clubs such as the Sydney Swans, Collingwood, Essendon, Adelaide and West Coast at the top of the overall AFL club supporter ladder, a key metric for AFL clubs is their ability to convert their latent support into financial members that directly benefit the clubs. 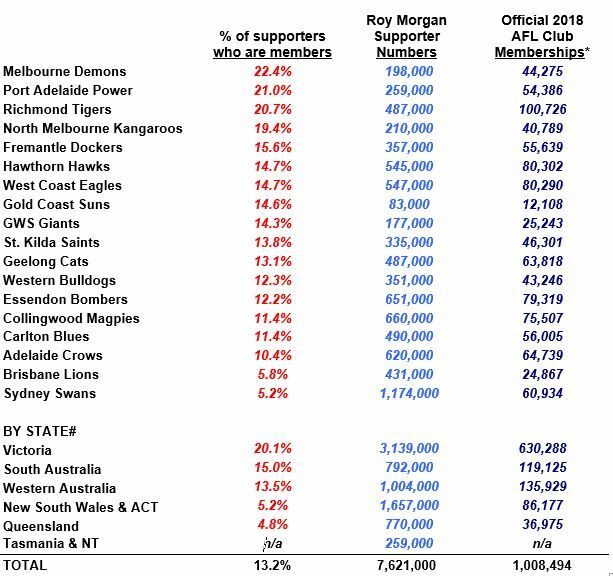 The table above ranks clubs based on how effective they are at converting their supporters into financial members based on dividing the (official AFL club memberships divided by Roy Morgan supporter numbers) x 100. On this important metric the long-suffering supporters of the Melbourne Football Club, who now have the longest Premiership drought of all current clubs, come out on top. The Melbourne Football Club converts a league-high 22.4 per cent of supporters to members just ahead of 2004 AFL Premiers Port Adelaide with a conversion rate of 21 per cent. Richmond’s staggering 2018 membership of over 100,000 – the first time any AFL club has signed up a six-figure membership – means the reigning Premiers now have the league’s third best supporter to membership conversion rate of 20.7 per cent well ahead of the other traditional ‘Big 4’ clubs. Commenting on the study. Roy Morgan CEO Michele Levine said: “The Sydney Swans are again Australia’s most widely supported AFL club for the 14th straight year now with 1.17 million supporters, over half-a-million supporters ahead of the two leading Victorian clubs Collingwood with 660,000 supporters and Essendon with 651,000 supporters. “However it is the recent success of the Western Bulldogs, Richmond and Hawthorn that highlights the importance of on-field performance to growing the supporter base in the stands. “The Western Bulldogs drought-breaking Premiership in 2016 has resulted in a surge of support for the club now at 351,000 and up a stunning 42.1 per cent from a year ago while reigning Premiers Richmond increased their support by 10.2 per cent to 487,000. “The most successful club of the last decade, Hawthorn, which has won four Premierships in the last ten AFL seasons – 2008, 2013, 2014 & 2015, also increased their support this year up by 3.2 per cent to 545,000 and are the now the third most support Victorian AFL club. “The standout clubs for increasing support outside Victoria were last year’s defeated Grand Finalists the Adelaide Crows who increased support by 14.6 per cent to 620,000 and last year’s defeated Preliminary Finalists the GWS Giants up by 1.1 per cent to 177,000 supporters. “In terms of passion – Victoria remains the beating heart of the AFL with over 3 million supporters buying around 630,000 AFL club memberships in 2018 – a conversion rate of 20.1% of supporters to members ahead of South Australia (15 per cent of supporters become members) and Western Australia (13.5 per cent). 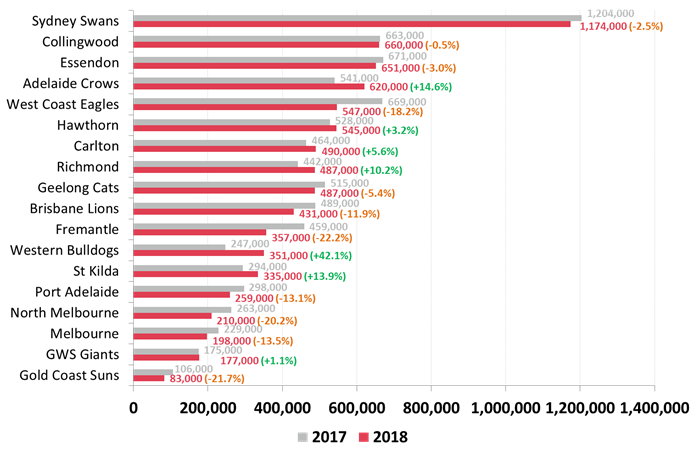 “The high conversion rates of supporters to members underpin the AFL’s strong attendances. In 2018 there are 7,621,000 supporters of an AFL club around Australia and with two rounds of the home & away season to go AFL attendance so far sits at a total of 6,270,730.